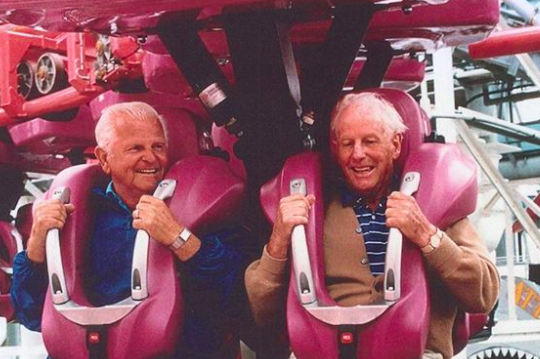 Bill Morey, left, and his brother Will ride a roller coaster at the Wildwood amusement park they co-founded, Morey's Pier. The co-founder of an iconic Jersey Shore amusement park has passed away. William "Bill" H. Morey "went to be in the loving arms of the Lord" on Wednesday, Morey's Piers announced Friday. He was 87. Born and raised in Wildwood by his parents Lewis and Clara, Morey was one of seven children - five sons and two daughters. He lived in the shore town his entire life. Bill founded Morey's Piers with his brother Will in 1969. Already successful entrepreneurs at the time, they entered the amusement business after noticing a giant fiberglass slide near a shopping center in Fort Lauderdale, Florida. The brothers purchased a similar ride, called "The Wipe Out," and from there began adding similar attractions to their park on the Wildwood boardwalk, according to the park's website. In addition to his business, Bill was an avid golfer. He was a member of the Wildwood Golf and Country Club and scored a hole in one at 80. Morey is survived by his wife Dolores, his brother William's wife Carolyn, his two sons William and Thomas, his twin daughters Jane and Joan, seven grandchildren and six great-grandchildren. Calling hours will be held at St. Ann's Roman Catholic Church at Magnolia and Atlantic avenues in Wildwood on Saturday, Jan. 21, from 9 a.m. to 10:45 a.m. A funeral service will be held at 11 a.m. at the church. In lieu of flowers and gifts, donations to the Pulmonary Care of the Cape Regional Medical Center will be accepted in Morey's memory.